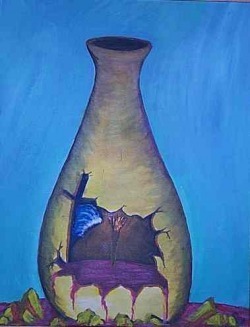 When a vessel is broken it releases what is stored inside. Spiritually this can be a good thing because God wants to reveal His work that is inside you. Also a breaking in our lives can reveal to our conscience things buried in our hearts that need to be brought before the Lord. Every person is different and what works for one might not help another. Only God knows what you need and when you need it. Brokeness can be a humbling act of our own will accomplished through fasting or in prayerful worship. In this painting I've used a mixture of elements taken from the Bible. The torch inside the vessel comes from the story of Gideon (Judges Chapt. 6-8). The cross, when a person understands that Jesus died their sins, brings true brokeness. The brokeness of Jesus on the cross released the eternal life, the living water and the new wine of the Holy Spirit.